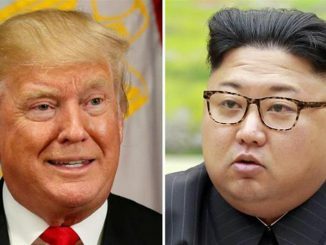 On June 12, the leaders of North Korea and the United States will meet across a table in Singapore, and Kim Jong Un must already be feeling giddy at the thought that this meeting is already being described with the word “summit” formerly reserved for meetings between superpowers of equal stature. As part of the final preparations for this encounter, North Korea had released three Korean/Americans it had previously seized. It was a predicable gesture. US President Donald Trump could hardly have sat down to talk while three US citizens were languishing in a Pyongyang labour camp, so North Korea did the necessary and gave Trump his photo opportunity. In any case, two of the three released men were Christian missionaries at the church-run University of Science and Technology in Pyongyang, which provides a convenient pool of Korean-Americans that Kim Yong-Un can seize at any time he likes, should his regime wish to indulge in another lucrative round of barter trade, sometime in future. Just what the Singapore “summit” can realistically hope to achieve remains as opaque as ever. Trump has tweeted that North Korea has already agreed to de-nuclearise. For the record, North Korea has been angling for a meeting with a sitting US President for yonks, in search of the status this affords. Just in case there is any misconception that the US has strong-armed North Korea to the negotiating table – an impression Trump has been assiduously promoting – North Korea has underlined that this isn’t the case, and oh by the way, it has utterly no intention of engaging in unilateral nuclear disarmament. Instead in Singapore, it will be looking for economic rewards. The U.S. has said its so-called “maximum pressure campaign” — under which it boosted sanctions and persuaded many countries to sever diplomatic ties with North Korea — was crucial in the North Korean turnaround. During [US Secretary of State Mike] Pompeo’s 13-hour visit to Pyongyang, however, North Korean officials were quick to counter that notion, telling the top U.S. diplomat that the rapprochement was the result of a plan to focus on economic growth now that the country had obtained nuclear weapons. In addition, as Bloomberg noted soberly, “North Korea still hasn’t committed to anything it hasn’t promised — and later reneged on — in past negotiations with the U.S. under Kim’s father, Kim Jong Il.” You bet. The full timeline for the past 25 years of promises, bogus concessions and economic rewards scored by North Korea can be found here, and it makes for blackly comical reading. Leave aside for a moment the weirdness whereby the country that has developed nuclear weapons and has them primed and ready to launch – North Korea – is in line to be rewarded by the US with the partial lifting of economic sanctions, while the country that has steadfastly agreed not to pursue them (Iran) is being punished with US sanctions intended to cripple its economy. What we’re heading into in Singapore is a Washington that has convinced itself North Korea is about to capitulate and disarm, and a Pyongyang that believes it should now be rewarded for completing and putting in place its nuclear weapons delivery systems. What could possibly go wrong? Some 48 hours after Trump’s decision to pull out of the Iran nuclear deal, the proceedings on the trade front has been fascinating to watch. As you’ll recall, US President Donald Trump not only re-imposed stiff new economic sanctions on Teheran, but also threatened to impose sanctions on any countries that helped Iran to achieve its nuclear ambitions. At first, Trade Minister David Parker and his counterparts in Europe seemed to be in the dark about just how widely the US would define the trade it might regard as being unacceptably supportive of Iran. Answe : all of it. For New Zealand, the amounts at stake in our trade with Iran are significant, and were set to increase. As Parker pointed out, the cost involved regarding Iran is double the $60 million that New Zealand already stands to lose from Trump’s new tariffs on our steel and aluminum exports. We have had an Embassy in Teheran since 1975, which makes it New Zealand’s longest-standing diplomatic mission in the Middle East. During the 1980s, Iran was one of New Zealand’s top five export markets. After the Joint Comprehensive Plan of Action nuclear deal was reached in 2015 and economic sanctions were lifted, the trade between Iran and New Zealand has resumed again in earnest. We sent an official trade delegation to Iran last year, and we sold $120 million of goods to Teheran in 2017, mainly in the form of dairy products. New Zealand is not the only country rushing for the exit. Since 2015, joint ventures worth $US10 billion have been signed between Iran and major European companies, to build everything from cars to aircraft. Trade with Europe surged to more than $10 billion, winning Iran the reputation as a plum opportunity for growth. Renault SA initiated a joint venture to build 150,000 cars a year in the Islamic Republic, while French rival PSA Group and its Iranian partner agreed to invest 400 million euros ($474 million) to upgrade a factory making Peugeot autos. Airbus Group SE won a $19 billion order for 100 planes. German engineering giant Siemens AG agreed to supply turbines to the country. Those deals are now up in the air. These and other attempts at peacefully integrating Iran back within the global economy are now being terminated by the US, with extreme prejudice. The Trump administration is giving foreign firms trading with Iran only six months to wind down those relationships, or face the prospect of punishing US sanctions. Across Europe, an undignified scramble has begun for exemptions and grandfather clauses. In effect, the Americans are being allowed to wield veto powers over a significant swathe of world trade. Business is not a realm where you expect to see people taking stands on moral principle, but this behaviour is pretty craven. Surely….shouldn’t the extra-territorial application of the sanctions that the US is threatening to take against all and sundry be something open to challenge at the WTO? Isn’t that the sort of behaviour that such bodies exist to prevent? For now though, Western capitalism (us included) is treating Iran as being entirely disposable, for fear of provoking the ire of the United States. It is not a pretty sight.